Here are links to sculptors and organizations with a common love for the horse. I will include links to equine organizations which serve as resources for sculptors interested in the horse, and notices for organizations seeking commissions. Suggestions very welcome. 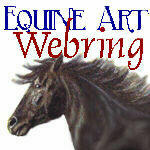 Check out links to the Equine Art Ring at the bottom of this page. Truman Bolinger - Western Cowboy Bronze Sculpture - Silver Spur Gallery "Truman Bolinger grew up on his parents ranch near Buffalo, Wyoming. Truman Bolinger & his wife, Barbara, own the SILVER SPUR GALLERY. Truman's studio is in the gallery, so you can come in and watch him working on his newest masterpiece. Truman has created bronzes for over 28 years and is recognized as one of the major Western Sculptors today. He has shown in major Galleries in Chicago, Dallas, Scottsdale, Santa Fe, Jackson Hole, Los Angeles and New York. Truman has had five sucessful one-man shows at Hammer Galleries in New York." David Cope "is a professional artist and sculptor of many years experience. As well as teaching and sharing his considerable expertise with students of all ages, he undertakes many commissions, including portraits in pastels, oils, acrylics and pencil, and sculptures in clay, wood, plaster and metal - including bronze. His equestrian sculptures in particular have been sold world wide. He is also an expert in the field of mask making, using latex and papier mâché." Sculptor Deborah Butterfield "Deborah Butterfield, an artist who has focused on the primal appeal of horses throughout her career, creates life-sized equines in materials ranging from mud to sticks to rusted sheet metal and steel. She has been creating larger-than-life sculptures since the 1970s. At that time, she wanted to construct something life affirming, nurturing. Since then she has developed a vast body of work that evokes, in subtle ways, all experience. This is accomplished through her main subject matter: the horse." Sculpture by Carol Cunningham "Carol has been a professional sculptor for over 18 years. She lives and works in Estes Park, Colorado, where her studio is located. She is considered one of the top equine artists and fast becoming well known in the wildlife sculpture field. Education and training has been through Lincoln University, Kansas City Art Institute, Southwest Craft Center, and McNay Art Institute. She was very active in horse breeding and training for many years. Carol also is a past Director of the Missouri Veterinary Museum. Her choice of subject matter is dedicated to capture the true form and personality of the animal in sculptures. Carol is well known for children interacting with her horse subjects." "The artist Cary J.van Dansik lives a quiet life with his family in the beautiful Dutch countryside. His love for horses is displayed also by several Arabians gracing his backyard serving as a permanent source for creativity of beauty and joy. As one of Europe's leading and most creative equine artists Cary J. van Dansik's work is often referred to as precious-classic-timeless, the very qualities of his most favourite subject: The Arabian Horse." Elisabeth Frink "Elisabeth Frink Horse and Rider, 1969 bronze, H 229.9 cm Private Collection Horse and Rider 1969 was the first of Elisabeth Frink's sculptures on this theme. She began to explore the subject in France in 1969 where her husband owned a vineyard, and the work reflects the sense of well-being that she experienced when in the country and in particular when she was with horses." Veryl Goodnight "Veryl Goodnight has been a professional artist for over 25 years. Strictly a painter until 1972, her subjects included horses, landscapes and wildlife. The switch to sculpture came from a desire to get a better understanding of anatomy. The public has a hearty appetite for Goodnight's unique bronzes. Goodnight's studio reports the sale of 50 horse sculptures alone in 1989. Goodnight's fascination with horses began early in life. Growing up, her family was not financially able to have horses, so she spent many hours drawing them and even sculpting them out of snow. One of the artist's most well-known accomplishments is "Paint Mare and Filly," commissioned by the American Paint Horse Association." Josephine Hurst "sculpts in several media, including plaster, clay, alabaster, and bronze. Her art captures lines of force in human, animal and abstract forms. While pursuing her doctorate in biology in New York, she studied under Manolo Pascual at the New School for Social Research and participated in various art exhibitions. She continued her formal studies in animal sculpture under Eugene Shortridge in Sarasota, Florida. She has exhibited at the Beresford Gallery in Palm Beach, the Bernice Steiner Gallery at the Jockey Club in Miami, and has managed exhibitions of equestrian art at the Royal Palm Polo Club in Boca Raton." Jeanie Innis "The love of horses seems to grab some of us at an early age . . . my mother tells me I clung to a carousel horse at the tender age of 12 months, and she had to pry me loose as I cried. Although I no longer cry, I find that my life is more fun if I am around horses; therefore, I sculpt." Jeanie's Bronze Sculpture and Jewelry pages. Bronze Sculpture by Snell Johnson, Sculptor of the MGM Lion Snell Johnson is the world's most prolific and diversified designer and creator of custom bronze monuments of all sizes. His ability to capture the emotion and beauty of all animals, especially horses, has bestowed upon him the opportunity to create sculptures for many of the prestigious equestrian organizations including the annual awards for the Arabian Horse Association. See: Biography, Horses, Horse Sculpture Gallery, Native American, Sculpture Gallery Contact: snell@snelljohnson.com or 800-722-2203 in Phoenix Arizona USA. Alexa King Studios "With clay and wax Alexa King has captured the essence of movement in her subjects and transformed them into the classic medium of bronze. Earning international recognition as a sculptor, she has completed commissioned works for such prestigious institutions as The Nelson Rockefeller Collections, The Breeder's Cup Limited, and Time-Warner, among others. She resides in Wisconsin where she enjoys her children's involvement with their Saddlebred horses, the 20 year breeding program that has revolved around her beloved Hackney Horses and the notable National Champion Half-Arabians she has raised at her Good Thunder Farms." Horse Sculptures by DeeAnn Kjelshus "I've always been fascinated by horses. I've tried to express those feelings through my sculptures and customs of horses. I am currently taking orders for custom painting on horses. This does not include any sculpting or repostioning of the horse. I will paint any type of sculpture, resin, or model horse. These pages are divided up by horse colors, a page for my sculptures and customs, and a complete price guide for my custom painting, and a sales page. I do accept some limited orders for sculptures - inquire for prices." Texas Artist, Vic Kopycinski's "primary media is sculpture. His bronze sculptures are in collections in the United States, Europe and Japan. Each bronze evokes emotion by telling it's own story. Kopycinski limited edition bronzes are noted for the authenticity of their fine detail. He presently works at his studio in Lufkin, Texas." The Bronze Portfolio: Cammie Lundeen "As one of the premier equine sculptors working in America today, Cammie Lundeen has been closely associated with horses all her life. her resulting observations have enabled her to sculpt with exceptional depth and fluidity. The art magazine Equine Images credits her with "giving bronze the breath of life," and her awards and commissions certainly lend credence to that simple, but accurate observation. Cammie sculpts bronzes of all sizes, from larger-than-life to maquettes, and enjoys depicting individual horses as well as particular breeds." Alice McIntyre "Alice specializes in original, one of a kind pieces. Her lifelong fascination with horses has led to years of serious study and the accumulation of a vast personal library. An honours art student, she found the work she did in three-dimensional mediums to be intensely rewarding. She focuses almost exclusively on creating premiere sculptures in wood, stone and bronze. She operates a small bronze foundry at her home in Prince George, British Columbia, Canada. This ensures a hands-on approach through every step of the foundry process. She uses a direct wax, lost wax method to produce each piece." Martha Pettigrew "Del and I have bred and raised horses for 20 years, and we love most of all seeing the newborn foals with their mothers. It's fun to watch them grow and develop. It is also quite handy to have them nearby for use as models for my sculpture." Del Pettigrew "We have bred Thoroughbreds for 20 years although we only have one mare now, we were very involved in racing and breeding at one time. Martha is quite good with sculpting horses and I have plans to do some also. It's been handy for her to simply go out to the paddock, lift a leg, and see whats actually happens anatomically." Pat Roberts "Pat's work is in private and corporate collections throughout the World. Her sculptures can be seen in the European Museum of Art, Clarence, New York; Galleria Kocken, Kenelaer, Germany; The Osborne Studio Gallery, London; and at her home studio in Solvang, California. Living with her husband, Monty, on their beautiful horse farm, Flag Is Up Farm, has given her the opportunity to study the subject she loves best: the horse in motion. An accomplished horsewoman who has bred, trained and exhibited horses, Pat has years of experience from which she has drawn to create numerous equine sculptures. " Gigi Scullion, sculptor: "Gigi Scullion is a passionate woman. She is passionate about horses. Even in early childhood, she managed to be near them, feed them, cares for them, rides them and record her observations of them in countless drawings." "An unassuming woman, Gigi Scullion's art production adheres to the highest standards of quality. In each of her sculptures she strives for maximum accuracy of detail. Her aim is not to copy nature but to conquer it by capturing the vital life energy of the moment in all it's glory. The emotion of the jump, the flight, the race, the inherent dignity of the animal in play or rest is captured in bronze by her undeniable genius. The quality of Gigi Scullion's art makes her one of the best sculptor of animals in North America." Equine Art by Lynda Sappington "Lynda Sappington's work is in collections across the country, and has been in galleries from California to Ohio. She is an award winning sculptor, photographer and writer whose awards have earned her a place in the 1994 and 1996 Marquis Who's Who in the Midwest." She produces works in bronze and cold cast porcelain. Some sculptures include "Fascination,", "Reflection,", and "Lazy Afternoon". Stacey Tumlinson- Equine Sculptures I am a freelance sculptor from Oregon. Currently most of my work is commissioned by United Design Corporation in Noble, OK, for whom I have completed over 50 sculptures. Aside from the work I do for them, I have many projects of my own that I am working on as prospective bronzes or limited edition resins. If you are interested in having a sculpture commissioned, please contact me and I will be happy to answer any questions you may have. You will find my prices reasonable and I am very easy to work with. See: Finished Equine Sculptures, North American Wildlife, Equine Works in Progress, Arabians Contact: tabasco@pioneer-net.com or 541-677-9143 in Oregon USA. Kristi Usher, Western Bronze Sculpture - About the Sculptor - Incredibly detailed and authentic western bronze sculptures. Kristi has lived all of her life in Oregon, ranching and working with horses, her first love. Her talent for art became evident very early and with no formal training, she has developed a special and realistic style. Her love for the western way of life and for art has given her a vision she wants to share with the world through her exquisite and moving sculptures. See: Gallery, Work in Progress, Ordering Information, Links. Contact: kkusher@crpud.net or 503-397-3740 in St. Helens, Oregon USA. Lynn Wade, Sculptor, Painter : "Nationally known as an animal portraitist and magazine illustrator, her work has, to date, garnered five American Horse Publications Awards nominations for Best Drawing of the Year. She authored and contributed artwork to the book "The American Academy of Equine Art Sketchbook of Horses at the Kentucky Horse Park"published by Equus. Lynn's two- and three-dimensional work has been juried into national shows at the Kentucky Derby museum at Churchill Downs, The Museum of Hounds and Hunting, The National Dog Museum, The Pastel Society of America and the Catherine Lorrilard Wolfe Art Club at the National Arts Club in New York and the International Museum of the Horse at the Kentucky Horse Park. She is an award-winning full artist and board member of the American Academy of Equine Art (AAEA)." Anita Watts Sculptor of Bronze Equine Sculpture Anita is known for her realistic bronze sculpture that captures the lively interaction between people of all ages with horses, dogs, plus a variety of pets and wildlife. "In my sculpture I am trying to express this special connection that some people have with animals… the ability to communicate and become as one. I look for a situation where there is an action and reaction. It is that interaction between people and animals that I try to capture… that life, movement, and suspended animation that takes place in the magical moment when humans and animals connect. I call it "Creating the Connection". Anita's sculpture exhibits spirited energy and excitement for people who love to interact with their animals. See: Biography, View Sculpture, Exhibits&Shows, Work-in-Progress Contact: info@anitawatts.com or 937-456-3125 in Eaton Ohio USA. Dawn Weimer, "Dawn's education came unconventionally, on horseback! Many years of raising and training registered Quarter Horses equipped her with an incredible understanding of horse anatomy and behavior. She feels that translated into a greater knowledge of animal anatomy and behavior in general. She was designated as the 1996 Equine Artist of Distinction by the North American Horsemen's Association. Her work has been featured in Wildlife Art, Southwest Art, Art of the West, Equine Image, Western Horseman, Art Revue, Horse & Rider and on the covers of North American Horsemen's Yearbook and Chronicle of the Horse.Her work is installed in several municipal public art sites and in the permanent collection of the City of Fort Collins, City of Westminster and American Quarter Horse Museum." Animals, Equine, Figurative, Monumental. Stevenson's Gallery - Joseph Lutter Each one of Joesph's horses is individually designed with the creative energies of this artist flowing forth to portray his own unique and appealing style. The bold, muscular physique, the light-hearted toss of the head, from the most delicate detail of the trappings to the old man (Joseph's trademark, depicting the wisdom spirit) who rides just beneath the saddle cantle, all superbly executed by hand, in basswood, with the skill and grace of a master carver. Sculptress Irma Melaja ( 1955 - 1991 ) Irma Melaja was born in Hyvinkää, Finland, in 1955. She got interested in her main subject, the horse, at an early state - and used it in almost all of her work. Irma Melaja died in her home in Karkkila, Finland, in the autumn of 1991. She was a sensitive person, but often seemed strong and persistent enough to never need anyone. She knew one can't learn to know life in any other way than through experiences and experiencing it - though sometimes one's experiences can grow much stronger than a person or life itself can be. Sculptures, Paintings. Alexander Phimister Proctor, c 1862-1950, equine sculptor. His son, Gifford Proctor, is a contemporary sculptor, but not equine. Contributed by Susan Proctor, granddaughter of Alexander. July 1997. See Sculptor in Buckskin, an autobiography by Alexander Phimister Proctor. Norman; University of Oklahoma Press:1971. Proctor was a Canadian-American sculptor, born in 1862 and working in Western themes and with animal motifs. 9"x7.5", 266 pages, b&w illustrations. See Half Dome story about Alexander. "Born in Boston of Polish descent, Korczak Ziolkowski was completely self-taught. He never took a lesson in art, sculpture, architecture or engineering. Orphaned at age one, he grew up in a series of foster homes. He began experimenting with woodwork as a teenager, and soon was sculpting in wood and stone. Korczak's 18-inch-high, African mahogany "Fighting Stallions" is his most popular wood carving. It is extraordinary in that it was carved across the grain and that the entire sculpture is balanced on the tail of one of the horses." Sign up your equine art site ! "Born and raised in Saskatchewan, Sheri brings into her art a lifelong passion for horses and drawing. Being completely self-taught, she seeks to bring out the life in the animals in her art by working in a highly realistic manner using colored and regular graphite pencils." The Equine Art Guild "This site is for lovers of horses & equine art of all types. The members of the Canadian based Equine Art Guild are on display here."